New violin arrived this morning. I ordered a cecilio electric from the fiddlershop at the end of march and it arrived this morning I'll post photos when i get home and have finished oooh-ing and ahhh-ing over it. So far everything looks great, the case is secure, violin is sparkly and intact (which i was scared about, UPS aren't exactly the best when it comes to handling boxes gently); it needs tuning obviously and then i'll give it a whirl. Got a few songs from musicals lined up ready to try and a few classical pieces. Very excited to start playing again! Actually i have a few pieces from Les Mis to try out. Yea way cool! Its fiddlerman present day.!! my beauty arrived today as well but barely unboxed things b4 having to run off.. YAY!! it was like midweek christmas Did you order from fiddlershop? What did you get? I got to unbox mine, have a quick look and then put it away and get back to work. That's basically what I did exactly.. took a look Made a sound and then ran out the door Promptly thereafter LOL. Actually I went a little bit crazy last week and picked up an electric as well.. A Bridge Lyra purple dragon. I can't wait to hear your reaction after testing the Kreisler. I loved that particular violin. You barely have to press at all to get a great sound. So Ive taken it for a spin and have a few questions. I've never had a brand new violin before so I'm not used to a breaking in period. The strings, I got them tuned and then almost as quickly they untuned, i don't mind true tuning every now and then when playing but really hope after a while they'll settle down and stay tuned for more than 1 scale. Also, the pegs seem a bit loose, this might be because its new and this might be the tuning issue. Can I get something to make the pegs grippier? i tried it out with the headphones and without, love the sound with them with the volume cranked and the tone up high. I also don't hate the sound without them. I think I'll have to rosin the new bow better but since I used my old one today it was fine. Congratulations! How exciting! I hope you enjoy both your new instruments. I could be wrong, but I think you'll find that both the strings and pegs have to settle in and, eventually, you won't have to tune as much. I'm sure others will weigh in on that, too. Can't wait to see the pictures and maybe a video or two! When you first tune up the instrument you need to go back and forth from one string to another. Start on the A and D then to keep the bridge stable and centered, then the E and G. Make sure that the bridge is straight up or slightly leaning back between tuning each string in the beginning. Once you have gone through all the strings several times and the violin is in tune you can expect a bit of stretching within the first hour and possibly up to 2-3 days, depending on what type of strings are on the violin.The Cecilio comes equipped with cheap steal core strings that don't take long to break in. Make sure you really press the pegs in hard enough while turning so that they don't slip. Don't press in with the pegs without turning them. As far as your question to keeping the pegs from slipping, you can always try peg drops. It they stick, you can try peg compound or peg dope <---- same product, different name. @kindascratchy, Thanks! I meant to post pics this morning but my cat was having dental work so the whole morning was spent watching him while he came out of sedation.. fun times. Pics when i get home! And once i've had a little practice maybe even a video or tow. @fiddlerman, Yup, i did tune that way, went from one to the other and tuned then up gradually. Mostly because i didn't want them to break, i've had a guitar string snap when tuning and those things sting when they whip you. I'm pretty sure the bridge is straight, i'll double check when i tune tonight. I also pressed the pegs in while turning them to get them to stick a bit better. If they're still slipping in about a week i'll check into the products mentioned. I only have 1 photo, the rest turned out blurry and i can't take any more tonight. 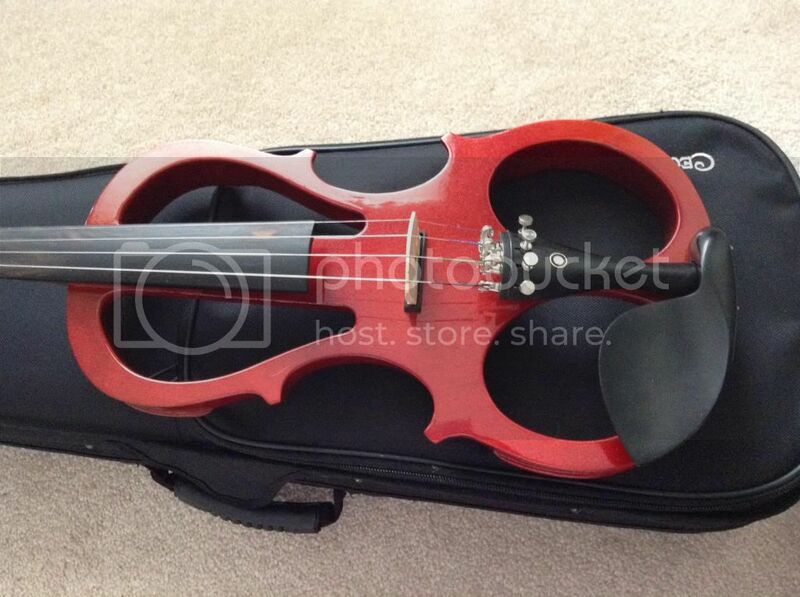 That's a particularly nice looking electric fiddle. Enjoy! Interesting > these electric violins always seem to look somewhat medieval with a fantasy touch to them > STrange, I like them > your instrument looks SWEET!! > looking forward to hearing it. From the picture is seems to be leaning slightly forward. Slightly back or perfectly straight is much better. Hope the strings settle for you. Thanks everyone! I like the red, i almost went with blue but the red seemed more me. This photo was just out of the box, i adjusted the bridge to straight when i was tuning it for the first time, i'll check on it periodically in case it moves at all. The strings seemed to stay tuned better last night so i guess it'll just take a few days.